Here’s a new podcast – I haven’t recorded one in a year! Listen on the player below or subscribe on Apple podcasts. This entry was posted in Cycling podcasts, Pro cycling and tagged Glasgow, podcasts on August 14, 2018 by Owen. I researched the historical context and background to the early career of John Kennedy in previous posts, looking first at the Belleisle Road Club and then at the first part of his racing career with the elite club that emerged from it, the Velo Club Stella. He was one of Scotland’s best riders, having been a National champion and winning stages and the mountains classification of one of the biggest stage races of the time, the ‘Oats’ amateur tour of Britain. Kennedy was demobbed from national service in the RAF in around 1953, moved to Belgium and later turned pro. After a great season, the zenith of his career came with a ride for Great Britain in support of Brian Robinson in 1960. He was one of the first Scots to ride the Tour, a little-known achievement that deserves wider recognition. The first British team had entered only 5 years previously, in 1955, under the trade team banner of Hercules. Ian Steel was in that team, the first Scot to ride the Tour. Kennedy’s pro career included seasons for former world champion Briek Schotte’s Flandria teams, and will have consisted of a Belgian kermesses – long, hard-fought races on several laps of a relatively short circuit on narrow country lanes. Scotsman Jimmy Rae had also travelled to Kortrijk in 1960 to ride as a pro, with the expectation of riding for the GB team in France in July, but he didn’t get on with the selector and wasn’t picked. Kennedy eventually got a call just three days before the race started, after the team had problems filling the roster. Not ideal preparation but who would turn down a call-up to ride the greatest bike race in the world, something he had dreamed of since leaving school in Glasgow? The Great Britain team for the 1960 Tour de France was built around Tom Simpson (above, third from right) and Brian Robinson (fourth from left). Robinson had won the first ever stage by a British rider in 1958. Kennedy’s last-minute call-up would certainly not have been ideal, especially since his preparation for a three week race with mountainous stages was a diet of Belgian circuit races and semi-classics. However he had good form: he finished 14th in Fleche-Wallone on 9th May, beating Gastone Necini (who finished 20th that day but won the Yellow Jersey at the Tour that year. The Fleche-Wallone results also included Rik Van Looy and five stage winners from the Tour later that summer: Necini, Louis Proost and Pierre Beuffeuil (who won a single road stage each), Michel Van Aerde (who the 15th medium mountain ,stage) and Jean Graczyk (who won four stages and the points jersey for the second time in his career). This isn’t to say Kennedy was as good as the Tour winner, but it shows the level he was at. The route took in Northern France and Belgium, including cobbled sections. before heading west to Brittany and then south to Bordeaux, with six of the first nine stages over 200km. From Cyclingpassions.eu, – these pages from French newspaper Miror des Sports showed were cobbles on stages 6 and 7. Terrain on which Kennedy excelled and was charged with keeping his team leaders safe. 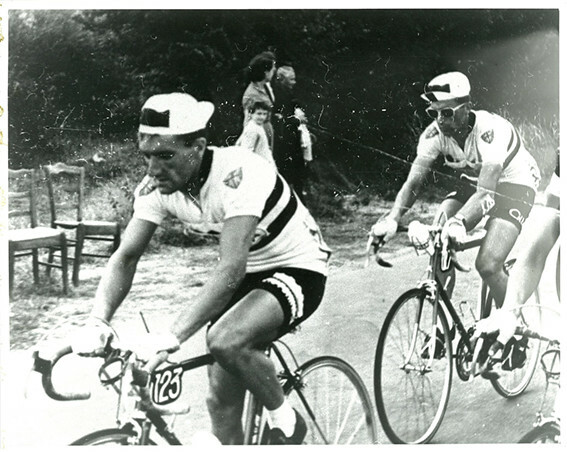 During the first 9 stages of the 1960 Tour de France, John Kennedy finished well up the field, often in the top 20, and never much lower than the 30s. Stage 4: 211km Dieppe-Caen: 28th @6:19 in a group of favourites, finishing on a cinder track on which Simpson crashed. Stage 6: 191km St. Malo – Lorient: 27th @14.40. 7 riders stayed away, including favourites Nencini and Riviere. Stage 8: 240km Angers – Limoges: 34th @9:10. 27 riders stayed away. Stage 9: 225km Limoges – Bordeaux: 32nd @4:32. 3 breakaway riders contested the win. Stage 11: 161km Pau – Luchon: (Tourmalet, Aspin, Peyresourde): 87th @22:02 with groups all over the road. Kennedy posted great results before the mountains, given his job was to ride in support of Simpson and Robinson all day, carrying bottles, pacing them back on after punctures, and shepherding them through the bunch. I imagine his expertise on flat and punchy terrain will have seen him near the front in the finale of these stages, keeping the leaders out of trouble. Writer Rene Delatour highlighted the inequality of 14-man French, Italian, Belgian and Spanish teams, while Great Britain and the others had only eight – even pacing his team leader Simpson back on, Kennedy was at something of a disadvantage. This is the type of riding Kennedy could do well with his experience in Britain and Belgium – he was built for these stages. With this inequality in team sizes, the farther the race went, the tougher life became for the smaller teams. Crashes, retirals, or finishing outside time limit reduced the size of teams so that the domestiques in smaller teams would have been subjected to a brutal work load. Larger teams could send several riders to assist their leaders after punctures or crashes, whereas small teams could only manage a couple of riders for this job, particularly in the later stages of the race. With Kennedy’s riding experience, it looks on paper as though he gave out after the first two major mountain stages in the Pyrenees: day 10 over 228km from Mont de Parsan to Pau, with stage 11 a brutal, classic Pyreneen stage of 161km from Pau to Luchon, which saw Norman Shiell and John Andrews both finish outside the time limit by 5 minutes. He had ridden well on the 11th stage, and the 12th stage was won by Jean Graczyk, who won two Tour points classifications in his career but was not viewed a climber. Also on stage 12 the mountain prime on the Portet d’Aspet was won by Jos Planckaert – followers of 1960s assure me was no climber either. So surely the pace uphill wouldn’t have been ferocious? “So modest were the hills” of stage 12, wrote The Sporting Cyclist, “that Darrigade won a bunch sprint up the top of the Col des Ares” (a prolific road sprinter). Although some Jean Graczyk a ‘non climber’, he also won a mountain stage (17) from Briancon to Aix-les-Bains in the Alps, as well as three other stages en route to the points classification. He was on a flyer that year and my gut feel is that many of the British team domestiques must have been a level below the Belgians, French, Spaniards and Italians. The story of the from Sporting Cyclist magazine, however, of the “comparatively easy” 12th stage from Luchon to Toulouse is of one that put paid to the hopes of two more of Tom Simpson and Brian Robinson’s lieutenants. The only rest day of 1960 came after stage 13. These stats certainly suggest that the going got too tough when the Tour hit the high mountains. But behind all the bare statistics there is a story for every rider in every stage. Each guy has his own version of the race, and the statistics only scratch the surface and are a snapshot. Jim Hay, a commenter on this site who started riding with the Glasgow Nightingale in 1946/7 offered to enlisted the help of a John “Gino” Goddard of the Kenton Road Club, who was in touch with surviving members of the 1960 Great Britain team at the Pedal Club lunch, to see if we could gain any long- lost insight. In addition to John, three of the team have passed away – Tom Simpson of course, Jock Andrews and Vic Sutton. Brian Robinson, now in his 80s, didn’t remember Kennedy, but this is unsurprising as the late call-up meant they wouldn’t have ridden together. Norman now apparently lives in Australia and was not contactable, leaving only Stan Brittain and Harry Reynolds to ask. Meanwhile, Stan Brittain who roomed with John told a darker story. John told him he had been feeling depressed for some time due to the widespread drug use in Belgium, making it very difficult to compete on even terms without getting involved in doping as well. This isn’t controversial – Tom Simpson’s use of amphetamines are well documented and were a contributing factor to his death in 1967. Roger Riviere, a favourite for the 1960 Tour, crashed on a descent trying to follow Gastone Nencini, and the injuries ended his career. Painkillers were found on his body and had admitted taking drugs for his hour record in 1958. Stan Brittain also recalled some marital problems that were contributing to this low morale. Another rider who knew John from his days in the Velo Club Stella reckoned that he received a letter via the Tour’s internal mail system informing of the end of his marriage during the Tour. I have never been able to corroborate this, but it is known that he returned to Britain and resettled, marrying again in Wales. Thanks to John Gallacher for supplying the initial photos that led to this piece, and to Steven Flockhart for help sourcing historical details and context. Acknowledgements are also due to Jim Hay, Gino Goddard, Norrie Drummond, Ray Green and Russell Galbraith. This entry was posted in Cycling history and tagged John Kennedy, Tour de France on August 1, 2018 by Owen. In this show I cover closed road cycling circuits in Scotland, including my own experiences at the much-loved Ingliston near Edinburgh. There is news about the Fife Cycle Park, which is starting to be built, and an interview with Matt Ball of the Linlithgow Development Trust about the West Lothian Cycle Circuit, which is entering its final phase of funding. This entry was posted in Cycling podcasts and tagged amateur racing, criteriums on August 14, 2017 by Owen. In this show I interview Kevin Johnston of the Clydesdale Colts cycling club and who is also involved in the the Scottish trials club. We talk about how young riders can use trials bikes to get on bike skills quickly that can be easily transferred to mountain bikes. In Motherwell they were looking to raise awareness of what he calls the best kept secret in cycling – how the trails bike can be used, and even with a simple grass area and cones course. Any Scottish cycling Go-ride club can get involved and Kevin is keen to share the knowledge. After that, keep listening I give a few thoughts about big event sponsorship based on my talking to a few major sponsors at the Motherwell tour series. Here’s Lee Craigie’s Ted Talk, as mentioned in the show. This entry was posted in Cycling podcasts and tagged mountain biking, Scotland on June 28, 2017 by Owen. In this show I interview Katie Archibald, who should need no introduction – multiple European champion on the track, a gold medallist in the Team Pursuit at the Rio olympics and recently crowned World Champion in the omnium. I net Katie during a talk to 3 primary schools – Ladywell, St Bernadette’s and another Motherwell school. She was there to encourage them to have a shot on their bikes, down at the velodrome or on the course at the Motherwell Tour Series on Tuesday 23rd May. I’ll be there in a work capacity, for my employers Robertson Group, a construction company that have contracts with North Lanarkshire Council, who are hosting the race. I hope to catch up with some of you on the day. I recorded this video at the last ever Dig In At The Dock Cyclocross race in Bo’ness at the end of February 2017. The race had grown to become a very big, successful and popular event – one of the biggest races on the Scottish calendar, with arguably the best atmosphere. It was much loved and will be missed. The organisers are stepping down after it has perhaps become a victim of its own success, with a tented village, band, printed programme and great course features to set up, and several bags of dog dirt to uplift before the race. Luckily Davie Hamill isn’t stepping back from race organisation entirely, as he explains towards the end of this video. It’s quite long, which in itself is an homage to Davie’s own video blogs. See if you can spot any other tributes to the original ‘Dig In’. This entry was posted in Amateur cycling, Video and tagged cyclocross, Scotland, vlog on April 13, 2017 by Owen. In this show I speak to Markus Stitz, a long-distance mountain biker, cycle tourist and bikepacker. He rode around the world in 2016 on a singlespeed bike. We talk about how he grew into riding such long distances, what bike and kit he uses, overcoming tragedy during the trip, and his next venture, encouraging bikepacking in Scotland. Listen on the player below, or on iTunes. 29er singlespeed wheel with Surly ultra hub and singlespeed specific screw-on Halo clickster freewheel – these provide simplicity and but the downside is that spares are less readily available than 26 inch wheels. Freewheel changed twice on the trip. 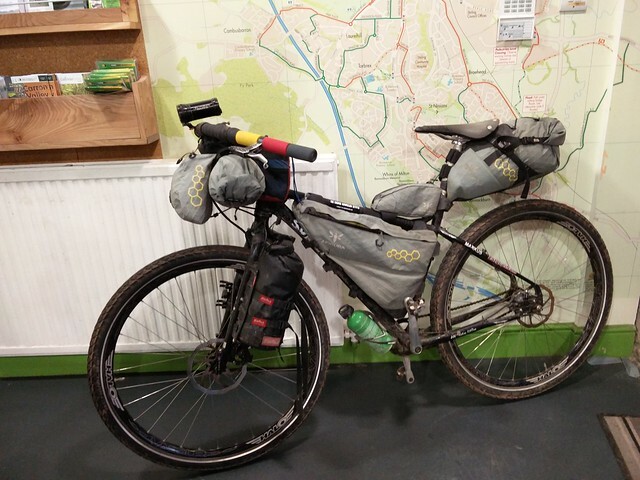 Schwalbe Marathon 2 inch tyres – heavy at 900 grams but have offroad capability and went 10,000 miles, halfway round the world, with zero punctures. Run with inner tubes and tubeless liquid sealant. Apidura frame bags, saddle bag, fork bag, stem bags and top tube bag – making weight more centred on the bike and improving handling. Brooks C15 cadmium saddle – ‘vegetarian’ version! Some sort of rubber. Rock solid with no softness to minimise. Width very important to fit your sit bones. If you’d like to hear Markus speak about his trip, he’s at Craigdon Mountain Sports on the outskirts of Edinburgh on 16th March. This entry was posted in Cycling podcasts and tagged podcasts, touring on March 11, 2017 by Owen. Scottish cycling podcast 15: Richard and Tom Seipp! Have you ever met a 12 year old that has raced 100 miles solo over 24 hours, ridden 215 miles in a day and attempted one of the toughest self-supported bike events in the world? This entry was posted in Cycling podcasts and tagged mountain biking, podcasts, Scotland, touring on February 13, 2017 by Owen. In this show I record my thoughts after a chat with Richard Seipp and his son Tom. They are speaking this Thursday 16th February in Edinburgh about long distance rides like the Highland Trail 550, the Strathpuffer 24 hour and tours in Europe. UPDATE: I managed to publish the full audio of my chat with Richard and Tom Seipp, which you can listen to HERE. In my first ever video blog, I do a bit of ‘active travel’, first cycling to work, then taking my bike on the train to Edinburgh for the afternoon. A look at integrated transport in Scotland. It was interesting to chat with Stirling Cycle Hub and I was grateful that Suzanne came on video at a moment’s notice. They have been doing good work at Stirling Train Station for several years now. I hope to get back there soon to do more audio or video content. This entry was posted in Urban cycling, Video and tagged Edinburgh, Stirling, urban on February 6, 2017 by Owen.